Sustained work by the Joint services is finally paying dividends with the capture yesterday of Vijay Seenarine, one of the New Amsterdam Prison escapees. 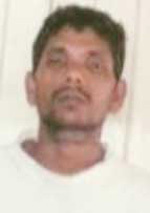 Seenarine, who along with three other prisoners fled the New Amsterdam Prison on June 11, was held around 11:00 hours as he was walking along J.C. Chandisingh Road at Rosehall, Corentyne, Berbice. At the time of his escape, Seenarine was on remand on a charge of carnal knowledge. His capture yesterday has provided Joint Services Ranks with vital information on the three remaining escapees Kevin “Long Hair” Narine, Raymond La Fleur, Vinood Gopaul, including the fact that they are now armed with guns. Except for a press release informing about Seenarine’s capture, the police remained silent on several aspects of last weekend’s operations in Berbice to recapture the escapees. From all indications, the police backed by the Guyana Defence Force helicopter and boats appeared to be on war footing over the weekend. Once again, Divisional Commander Steve Merai declined to comment, claiming that he was standing by the commissioner’s request that they do not speak to the media. Even senior army personnel declined to comment. However, according to a reliable source, during intense interrogation, Seenarine led ranks to a camp several miles up the Corentyne River where he pointed out a camp that he and the others had shared following the escape. The ranks also recovered a shotgun believed to be left behind by the three other escapees. “There is evidence that they (escapees) were actually occupying the camp,” the source told Kaieteur News. The source said that Seenarine revealed that following their escape, they had raided a camp along the bank of the Corentyne River and relieved the occupants of four shotguns. The operation commenced last Friday and the first piece of success was obtained on Saturday when ranks stumbled on a camp aback of Skeldon and found a shotgun. A press release yesterday stated that about noon on Saturday, ranks on patrol in the No. 58 Village Backdam, searched a camp during which an unlicensed 16 gauge shotgun with three matching cartridges was found. A man has been arrested and is in police custody assisting with the investigations. Also on Saturday, ranks of the Joint Services conducted a patrol up the Canje River and in the vicinity of Torani they found a field of about three acres under cultivation with approximately 15,000 marijuana plants ranging in height between two feet and four feet. The ranks also found an unlicensed revolver in an abandoned camp and two nurseries with about 10,000 seedlings. The marijuana plants and seedlings were destroyed but no one was arrested. On Friday, June 10 four prisoners, including a murder convict, escaped from the New Amsterdam Prison. The discovery of the breakout was made about 06:45hrs the following day, when guards checked the premises. The men who were both convicted and remand prisoners, somehow got hold of a ‘cement sling’ and used that to scale down their holdings before ripping a hole in the fence and making good their escape. A Commission of Inquiry headed by Retired Major General Norman McLean has since been set up to examine the circumstances of the escape. The source said that the Joint Services will continue to hunt for the remaining escapees who are now considered armed and dangerous.